An innovative new product for stimulating the mind and body has made its first appearance in American senior living communities. Named BikeAround™, the system combines the elements of an exercise bike with a large domed screen displaying images from Google Street View. Users pedal and steer through the interactive images to “visit” their childhood homes, check in on past workplaces, and look around their favorite vacation spots. BikeAround was designed to combine reminiscence therapy with safe, customized physical exercise for people with dementia. Riders are encouraged to talk about what they see and remember, which adds a social dimension to the experience. Senior Star is the first senior living operator in the U.S. to use the system, which is made in Sweden by Camanio Care. Senior Star received its first six bikes at the end of 2017 and added five more at the beginning of 2018. The company now has BikeAround in all of its communities. 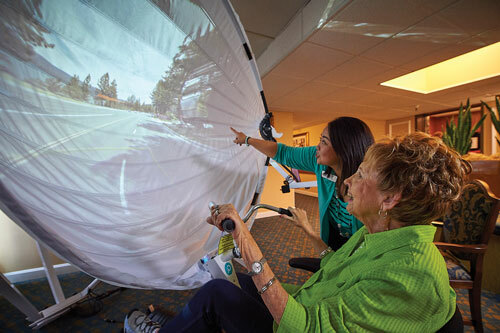 Although BikeAround was originally created for people with cognitive impairment, it has benefits for everyone from memory care residents to those in independent living. “All residents are able to engage with it and it’s easy for all associates to learn how to use it,” said Taylor Hernandez, director of innovation for Senior Star. Staff and family members are encouraged to use the bikes as well. Program director Sonya Pratt sets the course for resident Kathryn to bike to favorite destinations she’s visited in the past. Photo courtesy of Senior Star. Using BikeAround is simple. A staff member or other helper gets the resident seated comfortably on the bike and types the desired address into the computer. When a familiar location is displayed on the screen, the staff member encourages the resident to engage with the images and talk about what he or she sees. The jDome screen, which was originally invented for gamers, was incorporated to make the biking experience feel more lifelike. The rider sits very close to the dome, filling his field of vision with the images, and the view changes as he navigates through the scenery. “We can see the residents turning their heads to look around to see what’s on the street or what’s to the left or right of them,” Hernandez said. BikeAround is very effective in helping residents connect with their pasts. People with dementia have become much more alert and talkative as they recall vivid memories of places, people, and events inspired by something they see on the screen. “For that moment in time, during that experience, they are back to reality as if they didn’t have dementia,” said Ron Keller, executive director at Senior Star at Dublin Retirement Village. Keller initiated the company’s interest in BikeAround last September after he heard about it from a fellow board member of the Alzheimer’s Association. At the time there was only one other BikeAround in the U.S., and that was at a physical therapy rehabilitation facility in Des Moines, Iowa. Keller passed the information on to Senior Star executives, who promptly ordered six bikes from Camanio Care. In January 2018 they ordered five more to provide one for every Senior Star community. “I’ve been with the company for 22 years and this is probably one of the most powerful programs I’ve ever seen,” Keller said. The benefits of reminiscence therapy with BikeAround go beyond the immediate pleasure of recalling happy times. “Many people who are living with dementia want to go home, and they can be very persistent,” Dahlberg said. “If you’re able to allow this person to go home one, two, or three times a day, it calms them down.” She notes that it has helped reduce anxiety in some users, allowing them to sleep better and feel happier overall. BikeAround provides a safe and fun way for residents to exercise in a monitored environment. Each component of the BikeAround system is fully adjustable to accommodate all body types and abilities. People with more severe physical limitations can simply sit in the seat or even on a chair and look at the screen. An associate or other assistant can navigate through the screen view by using the arrow keys on the computer. “It’s really accessible even if folks can’t use the pedals or steer,” Hernandez said. Most riders use the bike anywhere from five minutes to an hour at a time. Usage depends on their physical ability and how absorbed they are in recalling memories. Dahlberg said that people are generally able to exercise longer when they are fully immersed in the experience. One of the most rewarding benefits of BikeAround is its ability to facilitate social connections among residents, family members, and staff. Dahlberg has also found that the bikes provide unique opportunities for residents to get to know each other better. She mentioned two people at community in Sweden who didn’t know they had worked in the same place under the same manager until they shared their memories at the BikeAround. Everyone at Senior Star, including associates and family members, is welcome to use the bikes. Family members can use them to show residents where they live, work, or travel. Sharing life stories, whether past or present, helps build stronger connections throughout the community.